Pets Alive-El Paso's focus is reducing pet overpopulation through our Spay/Neuter Voucher program. We are not an animal shelter or rescue organization. If you are trying to find a home for a pet, here are some tips, as well as a list of no-kill shelters and rescue groups which may be able to assist you. 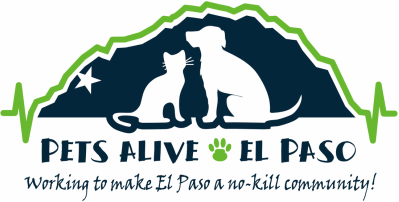 Please note that El Paso's no-kill shelters and rescue groups are perpetually overwhelmed, so the more you can do to find a home for the animal yourself, the better. Use flyers, email, Facebook and other social media accounts and word-of-mouth to spread the word within your work, school, church, sport, hobby and social networks. Post flyers around your neighborhood and, if you live in an apartment or condo complex, in common areas such as the office, laundry room, gym and party room. See if you can get an announcement published in your church bulletin and/or in your apartment, condo, neighborhood association, work, school, club or other newsletter. Ask permission to post flyers at veterinary clinics, grooming parlors and pet supply stores. Many have bulletin boards for this purpose. Check with coffeehouses, restaurants and other businesses in your area to see if they will allow you to post flyers. Post a notice on Craigslist. Run an ad in your favorite newspaper. The following shelters and rescue groups are no-kill and may able to help you. Call or email to see if space is available and to make intake arrangements if the pet can be accommodated. Notes: If the Humane Society has room for the pet you need to place, please double-check to make certain when dropping off the that you are indeed at the Humane Society and not at Animal Services. The Humane Society is located right next door to Animal Services, and Animal Services is not no-kill. Some 20,000 dogs, cats, puppies and kittens are killed every year at Animal Services for lack of a home. Finally, if the pet is, or looks like it may be, a purebreed or breed-identifiable mix, you may also wish to check the AKC and Purebred Cat Breed Rescue breed rescue directories to see if there is an appropriate breed rescue located in Southern New Mexico, West Texas, or anywhere in the US which may be able to help. Some breed rescues are able to provide transportation assistance.